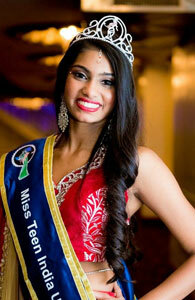 Miss Teen India New York is produced by the IFC based in New York City. The IFC first began its annual “India Festival” in Central Park, New York in 1974. An integral component of these festivals was the immensely popular “Fashion Show,” which IFC was the first to exhibit to the Indian and American communities. By 1979, the “Fashion Show” had become so popular that the IFC proposed to start the first ever MISS INDIA USA Pageant from 1980. The various groups/organizations in major American cities were contacted to start Indian Pageants in different states and send their winners to New York to compete for Miss India USA. The responsibility of organizing an Indian pageant in the tri-state area was taken by IFC and the first ever Miss India New York happened in 1980. For many years, we were requested by many young aspirants and their parents, as well as various state directors who were already conducting teen pageants in their respective states, to start Miss Teen India New York so that they can showcase their talent and gain confidence. Finally, in 2008, we decided to host the first ever Miss Teen India New York. Needless to say, the pageant was an instant success and has become a most sought after event for the teen girls of Indian origin living in New York. Starting from the basement of Air-India with an audience of twenty people, we have come a long way! With affiliated pageants in over thirty states in the USA and over forty countries around the world, IFC pageants are recognized as the most prestigious and longest running pageants outside of India. The winner of the Miss Teen India New York qualifies to enter the Miss Teen India USA Pageant, which IFC has started from the year 2012.